If you have any questions about the D75 Explorer information page below please contact us. Launched in 2012, the 75-foot motor yacht D75 Explorer is a lovely off-shore expedition vessel, built by Dauntless Yachts in Turkey. Developed for adventurous spirits wishing to explore remote, exotic locations in comfort and safety, D75 Explorer yacht boasts timeless look as well as flowing, distinctive style. 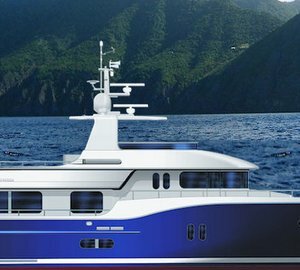 Her naval architeture is by Jon Overing of Overing Yacht Designs, while the beautiful interior design is by renowned JC Espinosa. Dauntless tri-deck luxury yacht D75 provides exceptionally comfortable accommodation in 4 magnificent staterooms for up to 8 guests. There is a full-beam master stateroom with his and hers bathrooms, along with 3 guest staterooms. The vessel's 2 professional crew sleep in separate ensuite crew quarters aft. 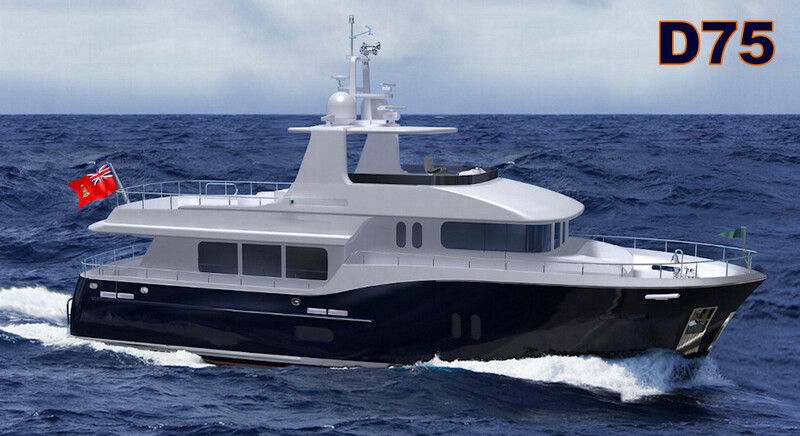 D75 Explorer yacht features a fast-displacement hull form, noted for its superior seakeeping qualities, increased speeds as well as fuel efficiency. D75 is powered by twin John Deere 6090SFm75 M3, 425 BHP @2300 RPM diesels. She is able to reach a top speed of 13 knots, with a cruising speed of 12 knots and an economical cruising speed of 10 knots. Her beam is of 6,4m (21'), while her draft is of 1,83m (6'). A total number of 8 guests is provided with the maximum comfort aboard the D75 Explorer yacht. She offers 4 well appointed staterooms, including a full-beam master cabin, as well as 3 lovely guest cabins. D75 carries an impeccable crew of 2, sleeping in separate crew quarters aft. We do have available further amenity, owner and price information for the 22.86m (75') yacht D75 Explorer, so please enquire for more information. The luxury yacht D75 Explorer displayed on this page is merely informational and she is not necessarily available for yacht charter or for sale, nor is she represented or marketed in anyway by CharterWorld. This web page and the superyacht information contained herein is not contractual. All yacht specifications and informations are displayed in good faith but CharterWorld does not warrant or assume any legal liability or responsibility for the current accuracy, completeness, validity, or usefulness of any superyacht information and/or images displayed. All boat information is subject to change without prior notice and may not be current.